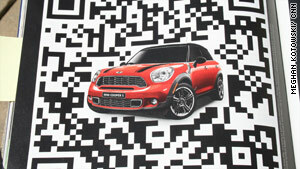 Brands such as Macy's are using black-and-white QR, or Quick Response, codes in magazine ads to market themselves. (CNN) -- A confused crossword puzzle. A psychedelic postage stamp. A bar code on drugs. Many QR scanning applications -- RedLaser is a popular one -- are available for Android, iPhone, BlackBerry and Symbian phones. Anyone can generate their own QR code for free. And you can link it to anything -- from URLs to contact information to your GPS location. "Imagine you see a poster of your favorite artist's upcoming concert," Galica said. "Usually, you would have to go home to look them up. But QR codes work as paper-based hyperlinks that can lead you to music videos, the site for MP3 downloads, and even purchase tickets right there." "The 'text to win' SMS campaigns have been very successful, and that's the trigger for QR codes," Galica said. 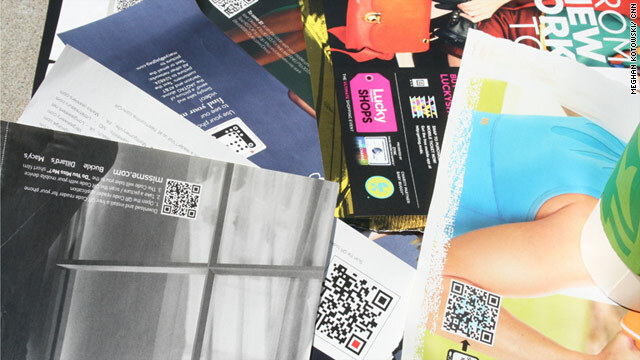 "Something like getting a coupon through a QR code is a powerful call to action." "I mean, what's the point of that?" he said. "You need to deliver something that is not available elsewhere and is something worthwhile, surprising,"
"You can the damage the brand of the company if you don't provide something of significant value," he said. "And I would not want to use your company." An ill-conceived QR code promotion can even backfire.Take the case of a recent promotional event surrounding the pre-release of hip-hop artist Lupe Fiasco's third full-length album, "Lasers." "The QR Code flashed and played previews for what looked like a music video -- with no sound," wrote Myles Tanzer on a New York University blog. "People began to walk away very quickly, to say the least." "It's one application that can speak to customers across so many vehicles," she said. "QR codes are such a sensible way to send content with immediacy." Both Galica and Brooks said they believe the United States has reached a tipping point in terms of smartphone usage. In other words, most affluent professionals -- the kind of person advertisers love -- have smartphones now, making it necessary to include QR codes with all marketing material. "At this early age of QR codes, though, there should be additional information and images on the poster (to provide context)," Sutton said. "QR codes may not give the best immediate returns of investments, but they can tell a prospective buyer how cool and hip your company is," Brooks said. "If you don't have the opportunity to interact with an advertisement you see, the meaning is lost," Galica said. Still, experts said QR codes are here to stay and will revolutionize the way companies market their products -- as long as they reward consumers with content that is relevant to them.